Reporter genes are the genes encoding a protein which can be tracked and quantified by microscopy and various biochemical assays. They provide a non-invasive and sensitive method to monitor levels of gene expression, protein localization and to determine the transcriptional and translational regulators of a gene of interest. In this study, Rosa and co-workers have developed a bioluminescence based reporter system using luxABCDE to monitor the growth and gene expression of Enterococcus faecalis. E. faecalis is a nosocomial pathogen reported to be the cause of diseases such as endocarditis, urinary tract infection, bacteremia etc. (Schlievert et. al., 1998) and particularly infects individuals with compromised immune system or suffering from an underlying illness (Mundy et. al., 2000). Several studies have been undertaken to determine the factors involved in the virulence of the nosocomial strains of E. faecalis (Jett et. al., 1992; Chow et. al., 1993; Shankar et. al, 2001). These studies involve creating mutants for a possible virulence trait and then comparing them in animal models. There are several advantages of using reporter gene in lieu of traditional methods which usually involve harvesting the infected organ and sample preparation to estimate the level of infection by E. faecalis (Hanin et. al., 2010; Ike et. al., 1984). This traditional method, apart from being time consuming, also requires sacrifice of a large number of animals used in biological experiments. Using reporter genes, although not able to completely replace animal experimentation, will certainly reduce the number of animals required. Another advantage of using reporter genes is that it will enable real time monitoring of spread of infection by imaging the light emitted from the activation of the lux operon which was not possible with the other studies that have been undertaken. Use of lux operon also provides several advantages over other reporter gene based systems used in studies pertaining to E. faecalis which employ green fluorescent protein (gfp) or firefly- luciferase enzyme (luc). 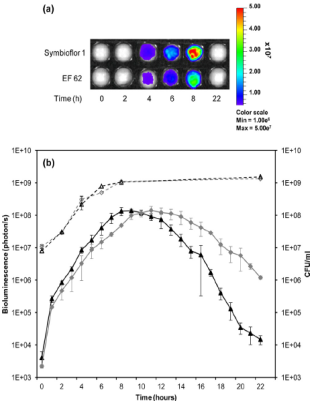 Both gfp and luc require excitation by an external light source and luc also requires the addition of an extraneous substrate- both of these are not required in case of luxABCDE thus providing another advantage to the use of this reporter system. (RBS) and an ATG codon fused at its end. 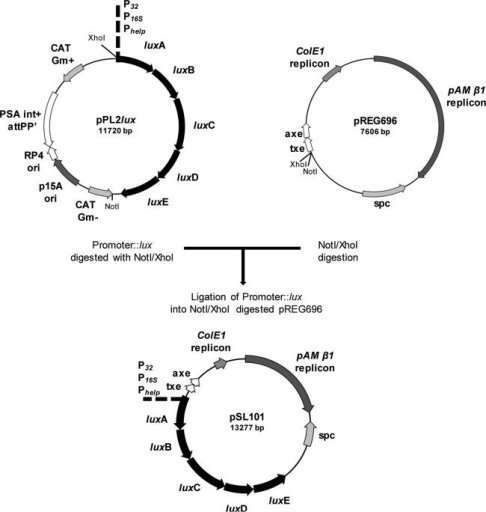 These modified pPL2lux plasmids were digested with Xho1 and Not1 and the excised fragment (luxABCDE and the promoter) was cloned into the corresponding sites in pREG696 to form pSL101P32/16S/help. pREG696 has a spectinomycin resistance gene and a segregational stability cassette (axe- antitoxin and txe- toxin) from the multi-drug resistant plasmid pRUM of E. faecium (Grady and Hayes, 2003). This segregational stability cassette enables stable inheritance of the plasmid by killing of plasmid-free cells. All the DNA fragments inserted were sequenced before transferring them into E. faecalis MMH594 by electroporation. plasmids was compared to pIL252luxABCDEPhelp which was created by cloning the Phelp– luxABCDE cassette into pIL252. This plasmid lacks the axe-txe stability system and is therefore lost after overnight culture with antibiotic selection (Figure 2a). On the other hand, there is no loss of pSL101P32 even after 7 days of culturing in non-selective media and only 30% loss in case of pSL101P16S and pSL101Phelp. This result shows that the segregational stability system is required for stable maintenance of the reporter plasmids in E. faecalis grown in nonselective media. The methodology adopted by the authors to do this experiment has two drawbacks- firstly, plating the culture onto nonselective and selective plates simultaneously may give erroneous results when there are more colonies on the selective plate than on the nonselective plate. To avoid this, the colonies on the nonselective plate obtained after incubation for 16 hours should be patched onto selective plates and then scored for antibiotic resistance phenotype. Secondly, nowhere in the manuscript do the authors mention doing the experiments in repeats. Performing an experiment in duplicates or triplicates is advantageous as it makes the data obtained more reliable. activity of the cells and thus high availability of substrate- flavin mononucleotide (Bachmann et. al., 2007) required for luciferase enzyme (Figure 3). 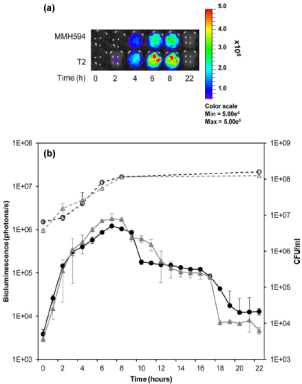 As the cells enter the stationary phase, a decline in the bioluminescence signal was observed corresponding to the decrease in the concentration of the substrate. Similar effect was observed for pSL101P32, pSL101P16S, pSL101Phelp. In case of the negative control, no bioluminescence was observed which confirms no background. Growth of different strains of E. faecalis was also monitored using the pSL101P16S system to determine its broad applicability. Four strains of E. faecalis differing in their origin (clinical isolate, probiotic strain, laboratory strain and commensal strain) were transformed with pSL101P16S and absorbance and bioluminescence was measured as above. As in the case of E. faecalis MMH594 a good correlation (R2 > 0.94) was observed between absorbance and bioluminescence thus proving that pSL101 system is not limited to a single strain of E. faecalis but can be used for other strains too. E. faecalis is normally found in urine and blood samples of people suffering from diseases caused by this microorganism. It is also commonly found in Therefore, pSL101P16S was used to monitor the growth of E. faecalisin these environments. To measure the growth in milk, Nestle NAN Infant Milk Formula was pre-heated to 37°C and inoculated with PBS (phosphate-buffer saline) washed probiotic strain Symbioflor 1 and commensal strain E. faecalis 32. Both the strains were lux-tagged with pSL101P16S. Bioluminescence was measured as described above and number of CFU was measured at 2, 4, 6, 8 and 22 hours after inoculation by plating the cultures on GM17 media with spectinomycin. The experiment was done in duplicates. 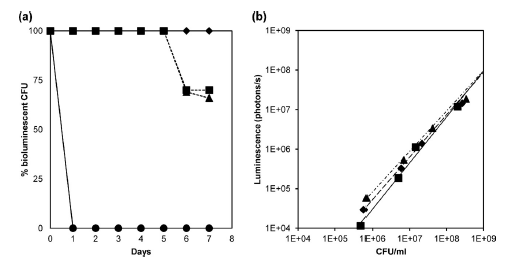 There was no background luminescence detected by milk and for both the strains, a linear correlation (R2= 0.95) between bioluminescence and viable cell count was observed (Figure 4). Similarly, growth of lux-tagged E. faecalis MMH594 and T2 was measured in urine by preheating the media at 37°C and inoculation with PBS washed cells. Although a low level of luminescence was observed in urine, there was a significant increase in the luminescence corresponding to the growth of bacterial strains (Figure 5) as in the case of milk. This experiment shows that the pSL101 system can be used in other growth environments as long as the background luminescence due to media is low. the lux-tagged strain was used to visualize the progress of infection in G. mellonella. Figure 6b shows the bioluminescent images of infected larvae captured till 48 hours after infection. The bioluminescent signal was detected immediately after infection and declined after 2 hours. After 4 hours post infection, a peak in the signal was observed and was constant till 24 hours after which all larvae were dead (Figure 6c). To confirm whether the bioluminescent signal corresponds to the growth of E. faecalis the infected larvae were sterilized by 70% ethanol and dissected and transferred into 0.9% saline solution. These samples were vortexed and homogenous mixture of insect and bacteria was serially diluted and plated on GM17 plated with spectinomycin. At each time period, 3 insects were dissected and number of CFU was counted. A drop in the number of CFU was observed 2 hours after infection but this was followed by increase in growth till 48 hours (Figure 6d). 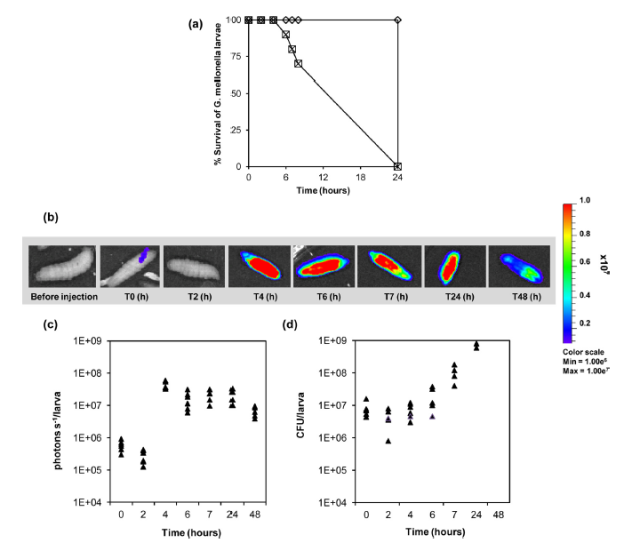 This result is in good agreement with the bioluminescent signal measured in the infected larvae and shows that the bioluminescent reporter can be used to monitor the progress of infection by E. faecalis in G. mellonella. The use of luxABCDE as a reporter for monitoring growth of E. faecalis in animal models has several advantages (as stated earlier). On the other hand, there are certain limitations of this system. Bioluminescence of luxABCDE relies on fatty acid synthesis and thus on the metabolic activity of the cells. Lower the metabolic activity lower will be the bioluminescent signal. Due to this, the pSL101 reporter system designed in this study may not be able to measure the growth of bacterial cells with low metabolic rate. This is especially disadvantageous in case of biofilm formation by E. faecalis in which the cells may have low metabolic activity. Also, the report does not describe the effect of pSL101 derivatives (with P32, P16S and Phelp) on the growth of E. faecalis. Although, it is mentioned that the growth of E. faecalis MMH594 strain with pSL101 is similar to the strain with pSL101P32, pSL101P16S, pSL101Phelp (data not shown) it is necessary to investigate whether the pSL101 and its derivatives present any metabolic load on the E. faecalis strain. The study shows that the pSL101 derivatives are stably maintained in E. faecalis but the plasmid stability test was done only for duration of 7 days and it is possible that the plasmids may be rapidly lost after this time period. This will prevent the use of the pSL101 reporter system to monitor growth of E. faecalis in other animal models, such as mouse, where long-time monitoring is required. Therefore, it is necessary to assess the stability of these plasmids in E. faecalis over a long time. Additionally, it may be difficult to observe any bioluminescent signal from deep tissues of animal models if the signal is weak, as in the case of low number of E. faecalis cells. In conclusion, a simple and robust reporter system using luxABCDE has been developed to monitor the growth of E. faecalis in animal models. Despite the limitations, this method is non-invasive and will significantly reduce the burden on experimental animals. It can be used to investigate the various genes involved in the virulence of E. faecalis facilitating better understanding of pathogenicity of E. faecalis. 1. Bachmann, H., Santos, F., Kleerebezem, M., et al. (2007) Luciferase detection during stationary phase in Lactococcus lactis. Applied and Environmental Microbiology, 73 (14): 4704-4706. 2. Chow, J.W., Thal, L.A., Perri, M.B., et al. (1993) Plasmid-associated hemolysin and aggregation substance production contribute to virulence in experimental enterococcal endocarditis. Antimicrobial Agents and Chemotherapy, 37 (11): 2474-2477. 3. Grady, R. and Hayes, F. (2003) Axe-Txe, a broad-spectrum proteic toxin-antitoxin system specified by a multidrug-resistant, clinical isolate of Enterococcus faecium. Molecular microbiology, 47 (5): 1419-1432. 4. Hanin, A., Sava, I., Bao, Y., et al. (2010) Screening of in vivo activated genes in Enterococcus faecalis during insect and mouse infections and growth in urine. PloS one, 5 (7): e11879. 5. Ike, Y., Hashimoto, H. and Clewell, D.B. (1984) Hemolysin of Streptococcus faecalis subspecies zymogenes contributes to virulence in mice. Infection and immunity, 45 (2): 528-530. 6. Jett, B.D., Jensen, H.G., Nordquist, R.E., et al. (1992) Contribution of the pAD1-encoded cytolysin to the severity of experimental Enterococcus faecalis endophthalmitis. Infection and immunity, 60 (6): 2445-2452. 7. La Rosa, S.L., Diep, D.B., Nes, I.F., et al. (2012) Construction and application of a luxABCDE reporter system for real-time monitoring of Enterococcus faecalis gene expression and growth. Applied and Environmental Microbiology, 78 (19): 7003-7011. 8. Mundy, L.M., Sahm, D.F. and Gilmore, M. (2000) Relationships between enterococcal virulence and antimicrobial resistance. Clinical microbiology reviews, 13 (4): 513-522. 9. Qazi, S.N., Counil, E., Morrissey, J., et al. (2001) agr expression precedes escape of internalized Staphylococcus aureus from the host endosome. Infection and immunity, 69 (11): 7074-7082. 10. Schlievert, P.M., Gahr, P.J., Assimacopoulos, A.P., et al. (1998) Aggregation and binding substances enhance pathogenicity in rabbit models of Enterococcus faecalis endocarditis. Infection and immunity, 66 (1): 218-223. 11. Shankar, N., Lockatell, C.V., Baghdayan, A.S., et al. (2001) Role of Enterococcus faecalis surface protein Esp in the pathogenesis of ascending urinary tract infection. Infection and immunity, 69 (7): 4366-4372. 12. Sugumaran, M. (2001) Control mechanisms of the prophenoloxidase cascade. Advances in Experimental Medicine and Biology, 484 289-298.